What was known as Inside Congress, a Congressional database owned by The New York Times, was renamed Represent yesterday when it was taken over by ProPublica. The thread linking both incarnations together is ProPublica news applications developer Derek Willis. Before joining ProPublica, Willis has been a developer and reporter at The New York Times, where he started the Inside Congress database. 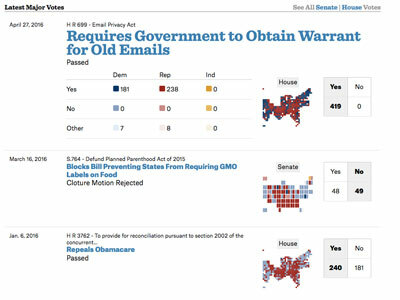 The database allows users to track how Congress members vote on bills, as well as explore the details of the bills themselves. In taking over the database and its accompanying API, ProPublica has added new features, including the ability to view a profile of each Congressperson. It even helps you find out how often they play hooky. The team will continue to update the database, both in the existing areas it’s looking at, and later, with new metrics.